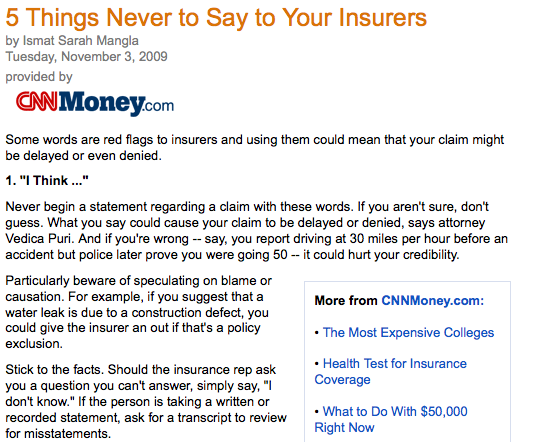 I got this article from CNNMoney.com and this is a guide on what not say to your insurers to get a claim. This only shows that insurance in the US is much strict and very much regulated compared to the Philippines. But you have to realize it also that Insurance in the US is very very expensive and can not be negotiated unlike again here in our country, non-life insurance companies doesn't have the power to do that. In fairness to Insurance Companies in the Philippines, they are already doing a great job in supporting customers claims and complaints despite the fact that Insurance Premiums here are way below the tariff rates provided by the Insurance Commission. Cause and Effect! After reading this article, you might get scared of how hard it is to claim and the insurance might not pay you,etc. You don't have to worry, all you need is a reliable agent that provides you with expert advise from day 1 and gives you personalized service when you need it the most!